Bryan Tan is the new CEO for Dads for Life and the Centre For Fathering. The story of his evolution as a dad is an inspiration to all dads who want to grow their relationship with their children. Bryan Tan, a Senior Officer in the Singapore Armed Forces, entered into early retirement from his full-time management position in the military on 1 August 2016. He assumed the role of CEO in Centre For Fathering and Dads for Life on 2 August 2016. 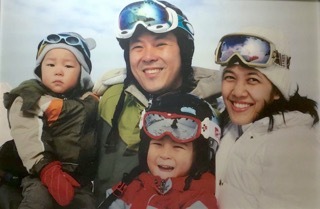 His wife, Adriana, is an entrepreneur and they have three children – Michael, 7, Joshua, 3, and Deborah, 2 months of age. As the new CEO for the Centre For Fathering, Singapore, you might expect that Bryan Tan would be a model father. It turns out, he simply wants what’s best for his three children, and is on a quest to discover what “best” means, and continuously work towards that goal. At the time, Bryan was enjoying a career in the military, and there were a few dads in his workplace. Becoming a dad was not the most natural choice for him, as he felt there were too many unknowns to deal with, especially not knowing what fatherhood entailed. He revealed that he had “not much of a relationship” with his own father at that stage, which added to his apprehension towards taking on such an imperishable responsibility. After his first two children were born, he felt that he had been the best dad in the world in terms of providing for them materially and in the area of financial planning. He had also been giving them “the best gift I can give my children – which is to love their mother, for that’s also marriage preparation 101 for them”. However, Bryan shared that he also endured doubts and periods as a father when he felt “at his wits end”. In November 2015, Bryan chanced on the Breakfast with Dad programme run by Centre for Fathering. Along with a few dads from his workplace, he signed up. Participating in the programme, Bryan was deeply impacted as he discovered that there were cognitive and emotional areas in which he had little engagement with his eldest son, Michael. That breakfast at Centre For Fathering would lead to a major turning point in his journey as a dad. To meet that major objective, Bryan sought an “early-retirement” from the military and moved to a career that would be conducive to invest fully in his children. Bryan is also thankful that wife has always been a support in his individuation into his fathering role, as she patiently provided him the latitude to develop in the areas of fatherhood that often left him struggling to find the best workable approaches and strategies. As Bryan began to focus more on his children, he learned to let go of his personal expectations of them, and deliberately paid particular attention to discover their strengths, passions, and things that inspired them towards self-motivation. His eldest son is physically active, curious and loves tinkering (with gadgets and other objects), and Bryan encourages his curiosity, often tinkering alongside with him. Of course, ensuring discipline is also a big part to play in his children’s lives and Bryan makes sure that he also communicates the emotional consequences of inappropriate behaviour, often through explaining how their actions can hurt their parents. This visioning exercise helps Bryan to ensure that he creates virtuous cycles that cascade far into his family’s future. Continuing with the vision of turning the hearts of the children towards their fathers in his new role as CEO of Dads For Life and Centre For Fathering (which recently turned into a combined entity), Bryan shared that the organisations’ focus would be expressed in three thrusts – increasing engagement, equipping, and enabling. Engagement – to increase the awareness of active and involved fathering among the populace. The aim is to cause dads to pause and re-prioritise their role as fathers, because a dad’s window of time with his kids is so fleeting. Equipping – to equip more men and fathers to draw on their strengths and increase their confidence in their role. Centre For Fathering is well placed in this area, due to its programmes that have grown since 2000, having reached around 32,000 fathers to date. Enable – to enable the community, especially the leaders and fathering groups, first to serve as advocates and also to extend the efforts to equip dads at the grassroots level. Training the trainers, enabling these groups to conduct fatherhood workshops and experiential programmes would reside under this thrust. The culture of involved fathers continues to grow, and with Bryan at the helm of Centre For Fathering and Dads for Life, we can be sure that the hearts of many more children will turn to their fathers!